Important Dates including Photo Day, the Spring Tournament and Playoffs. Baseball is a game that combines skill, timing, athleticism and strategy. Some people think it is the ultimate combination. It is a game that is enjoyable to watch and play, both as a child as well as an adult. Engage your child early in the sport of baseball. Not only will you bring enjoyment to your whole family as participants and spectators, you will also be promoting and developing involvement in an activity that can be enjoyed throughout teenage and adult years as part of a healthy, wholesome lifestyle. Even if you or your child haven’t played in years, or never played at all, you can feel confident that your child will benefit from a league and volunteers that all share the desire to see every child has the opportunity to have fun learning to play baseball. Rules have been constructed to ensure participation and the atmosphere is what you make it. Nothing beats cheering for your son or daughter at the park on a beautiful summer night. All house league divisions enforce player rotation between the infield, outfield and bench defensive positions. Every player is in the batting lineup on offense. Rookieball introduces the player to a pitched ball with a pitching machine. The machine is consistent so players need not fear a wild pitch and the game keeps moving. These factors combine to keep everyone interested before moving to the increased competition and excitement of the player pitched ball in Mosquito and higher. If you are a parent new to baseball, and specifically Waterdown Minor Baseball, this section will answer some of your basic questions surrounding typical time and date commitments, travel and a handy table to determine what division your child will play based upon their year of birth. If you have additional questions don’t hesitate to use the various contact methods on this website to ask questions. Note: for the most update information on the following topics, please visit the Events Calendar for specific dates. Some dates are tentative and may be changed on an ongoing basis. In addition to normal house league schedules, players participating in Sr. T-Ball, Rookieball and Mosquito divisions are included in the annual Waterdown Minor Baseball Spring Tournament. This tournament is held at Memorial Park and is scheduled during June. Picture day for the entire league is scheduled during the tournament weekend. The last weeks of July will be playoff weeks. Wrap-up day and the championship games will generally be held on the last weekend of July or one of the first weeks in August, depending on where the August long weekend will occur (we do not schedule any events for the August long weekend). For all divisions, practices are scheduled at the discretion of the coach. The league encourages a minimum of one practice per week in Grasshopper and above. Practices are normally held on Saturday mornings or Friday evenings. Especially in the early part of the season, rainy weather can result in game cancellations. These cancellations could occur both before and right up to game-time at the park. Unless informed by the coach directly of a game cancellation, all players should plan to show up at the park regardless of the weather. Cancelled games will be rescheduled at a later date in the season and may fall on other days in the week than listed above. Field closures will be directed by the City of Hamilton and announced on their website. The following table provides a guideline for the potential locations and days during the week when games will be scheduled. While the association will make reasonable efforts to schedule within these times, it may be necessary to change these dates depending on registrations and diamond availability. This page will be updated when the schedule becomes firm and a news item will be posted. The normal season length will vary from 12 to 24 games. The regular season season will end near the end of July, with play-offs and the season wrap up finishing on the last weekend in July or one of the first weeks in August. The association attempts to provide a balanced schedule with an even number of games played against each team. Depending on the number of teams in a division, the season length can vary. For both T-Ball divisions, the season is shorter with fewer games. * Interlock – interlock indicates that WMBA teams in these divisions play within a larger geographic area as there are not enough teams within the WMBA to run a separate league. Home games will be played at the parks indicated, but away games will be held in the surrounding area. The schedule usually includes one home game as per the nights above and /or an away game on various nights from Monday to Thursday. 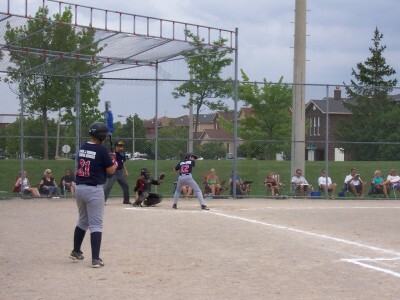 For Hardball age groups from PeeWee to Junior the WMBA participates in an Interlock league with Burlington Organized Minor Baseball (BOMBA) and the Oakville Minor Baseball Association (OMBA) as well as other smaller communities in the area including Milton, Carlisle, and Kilbride. For Girl’s Fastball, the WMBA participates in the Flamborough Minor Softball Association (FMSA). The WMBA is an affiliated association of the Central Ontario Baseball Association (COBA) which operates as an affiliate of the Ontario Baseball Association (OBA). Starting at the Rookieball level, the WMBA offers select programs which participate in the Select Ontario Baseball Association (SOBA).